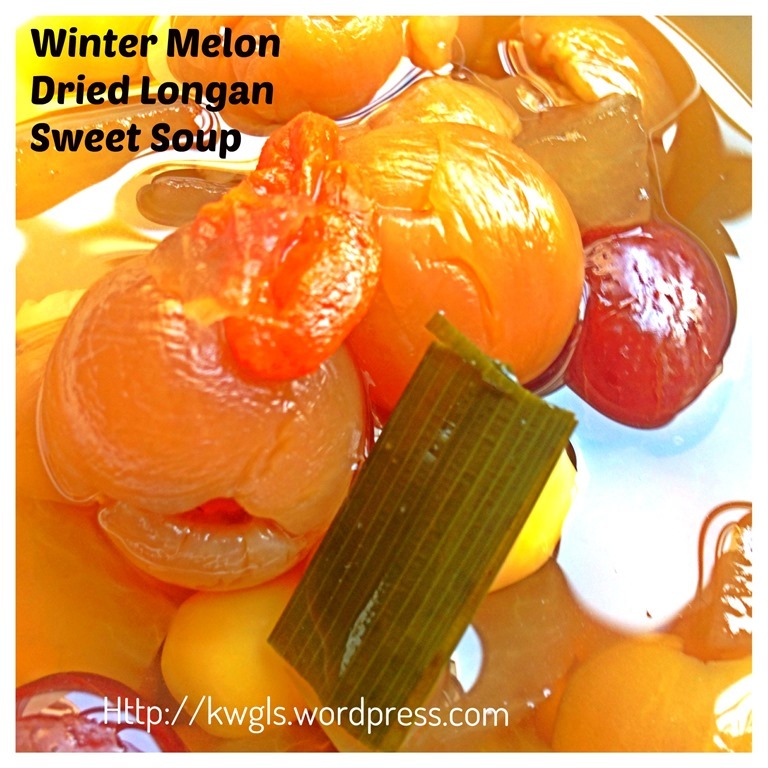 While I was cooking my winter melon soup for my Chinese meal yesterday, I found that the winter melon is rather big for my soup purposes and I have reserved part of the winter melon and cooked a Chinese style dessert sweet soup. 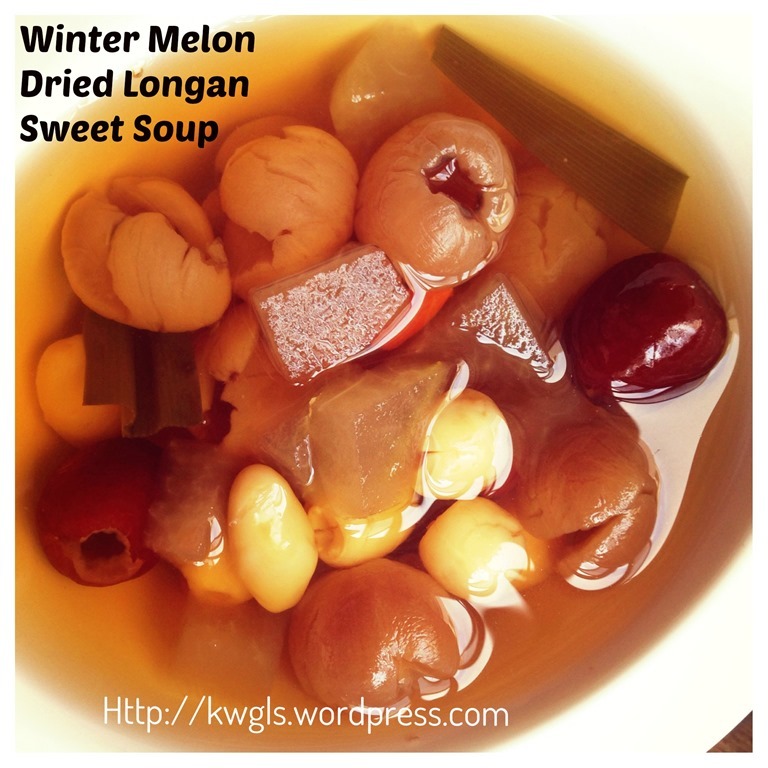 I paired it with other common Chinese sweet soup ingredients like dry longan, lotus seeds, gingko nuts, jujube, goof berries, rock sugar and flavoured with the fragrant Pandanus leaves. I usually cooked this is in a big pot and keep some in the fridge so that I can have some cold dessert drinks in the next few days. You can either serve it hot or cold but I love it cold as it is very thirst quenching. 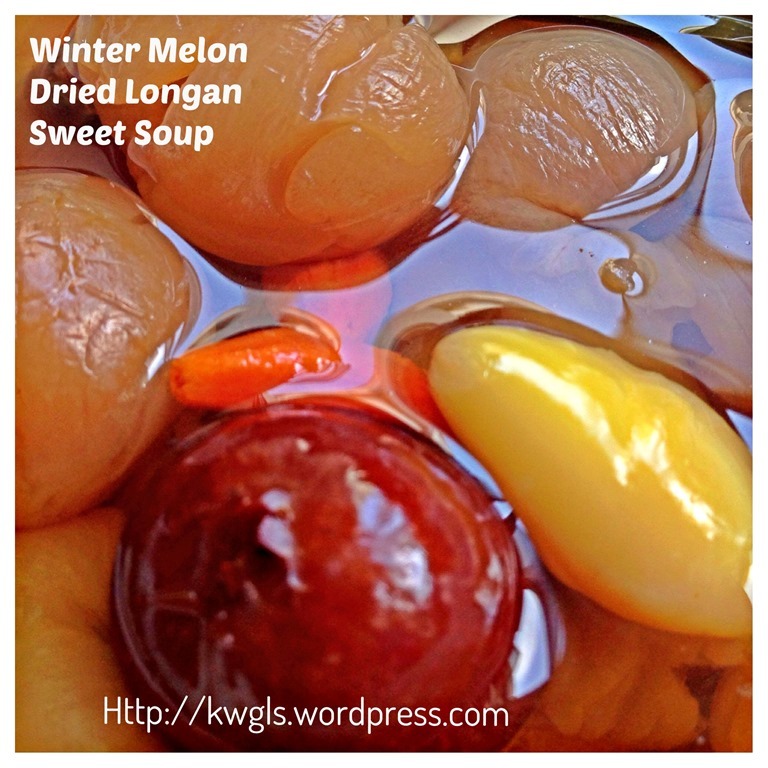 The 2 most important ingredients in this post is fresh winter melon and dry longan. 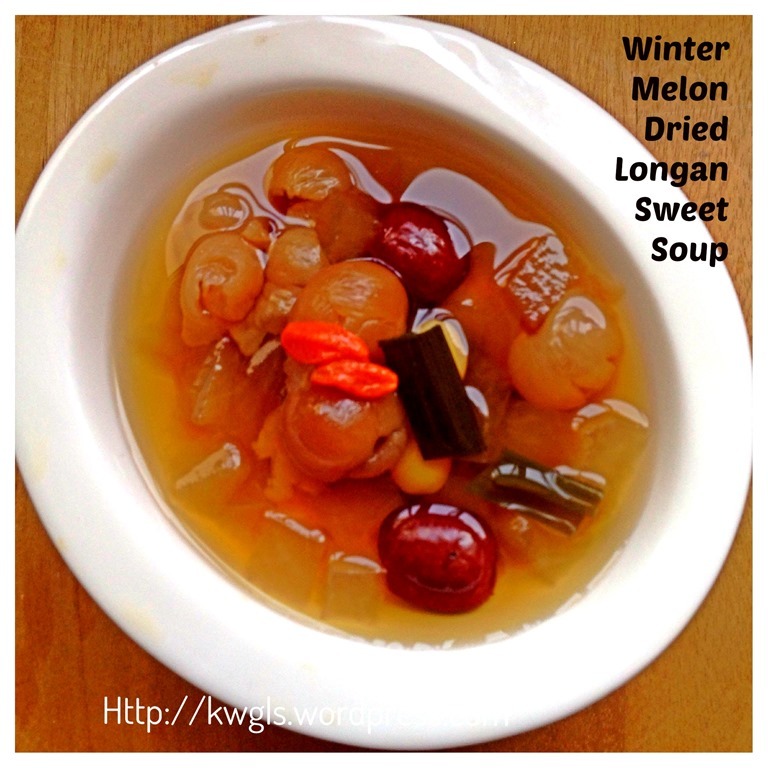 If you do not have the fresh winter melon, you can always used candied winter melon (冬瓜条/冬瓜糖）。All the ingredients used were believed to have the properties of body detoxification. 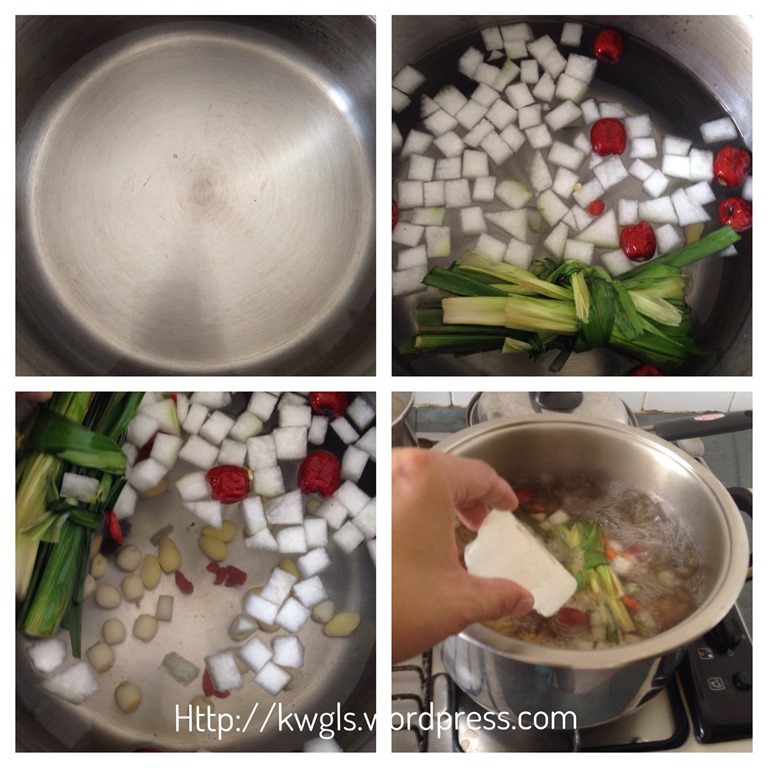 Cooking instructions were simple with only one image to illustrations and variations are many.. In fact you can omit most of the above ingredients to come out with a delicious sweet soup which most guests will not be able to object. Only quantities of major ingredients were stated and all side ingredients were optional and purposely omitted depending on your liking. 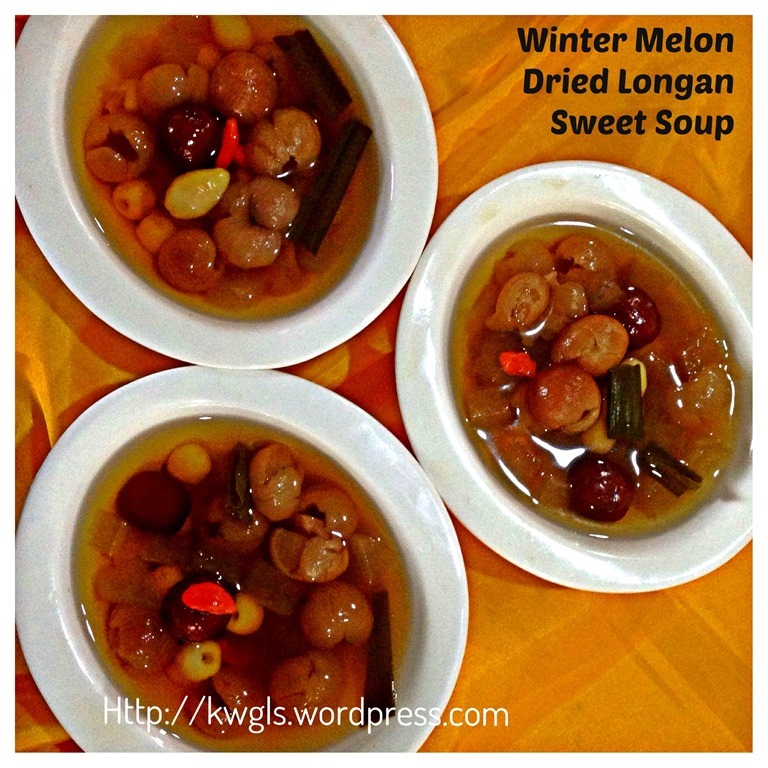 The winter melon, also called white gourd, winter gourd, or ash gourd, is a vine grown for its very large fruit, eaten as a vegetable when mature. It is the only member of the genus Benincasa. The fruit is fuzzy when young. The immature melon has thick white flesh that is sweet when eaten. By maturity, the fruit loses its hairs and develops a waxy coating, giving rise to the name wax gourd, and providing a long shelf life. 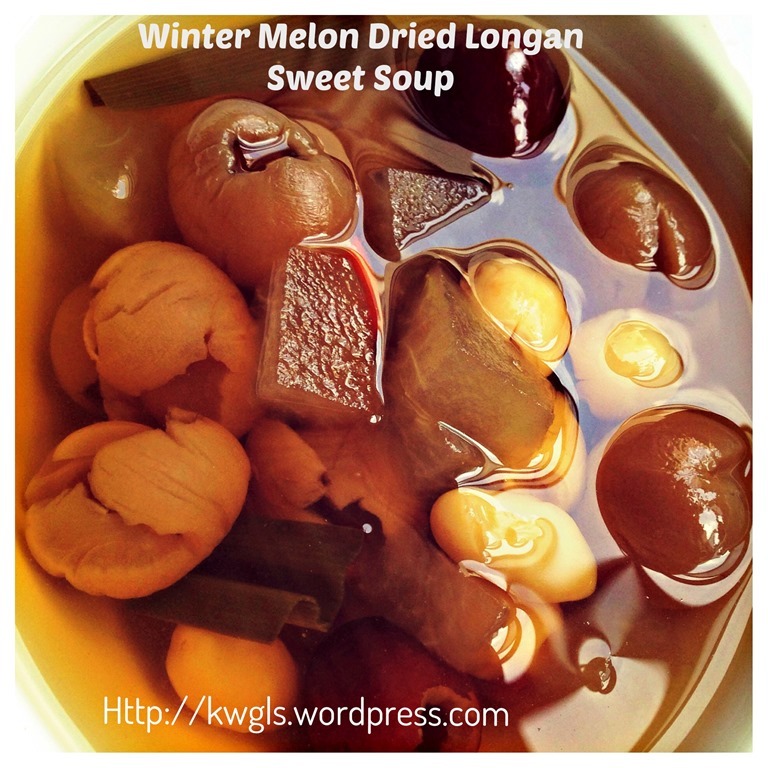 Winter melon is famous for its properties for body cooling and if you are interested to learn more about winter melon medicinal properties, you can refer to HEALTH BENEFITS OF WINTER MELON. 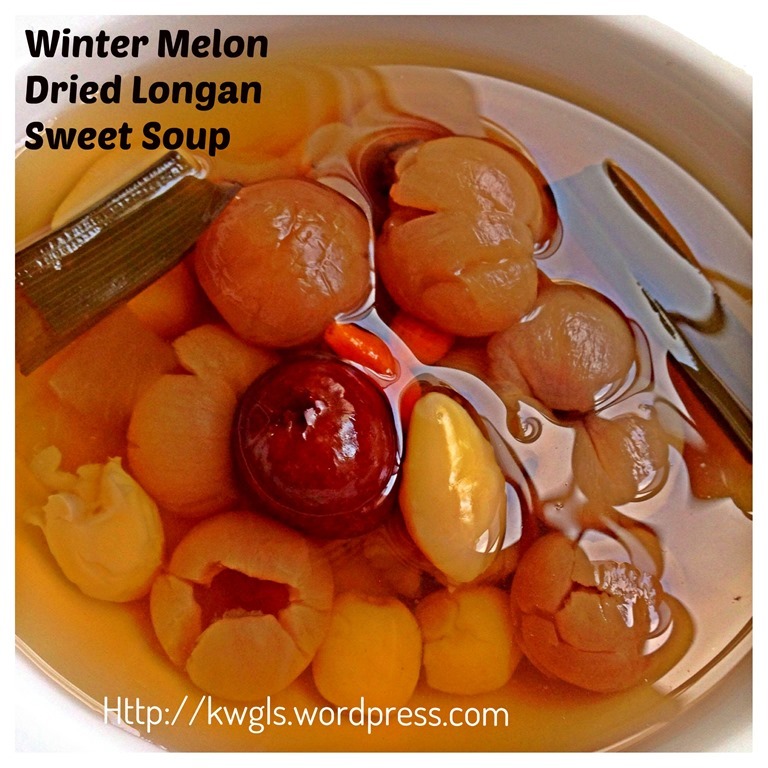 The longan (龍眼 Lóng Yǎn, lit. “Dragon Eye”), is so named because it resembles an eyeball when its fruit is shelled (the black seed shows through the translucent flesh like a pupil/iris). The seed is small, round and hard, and of an enamel-like, lacquered black. The fully ripened, freshly harvested shell is bark-like, thin, and firm, making the fruit easy to shell by squeezing the fruit out as if one is “cracking” a sunflower seed. When the shell has more moisture content and is more tender, the fruit becomes less convenient to shell. The tenderness of the shell varies due to either premature harvest, variety, weather conditions, or transport/storage conditions. In China, it is also called 桂圆 Guì Yuán and in Myanmar, it is called Deer’s Eyes. Put the water to a big pot. Add in all the ingredients except rock sugar (in fact, if you wish, you can also add in at this juncture). Bring to boil under high heat. 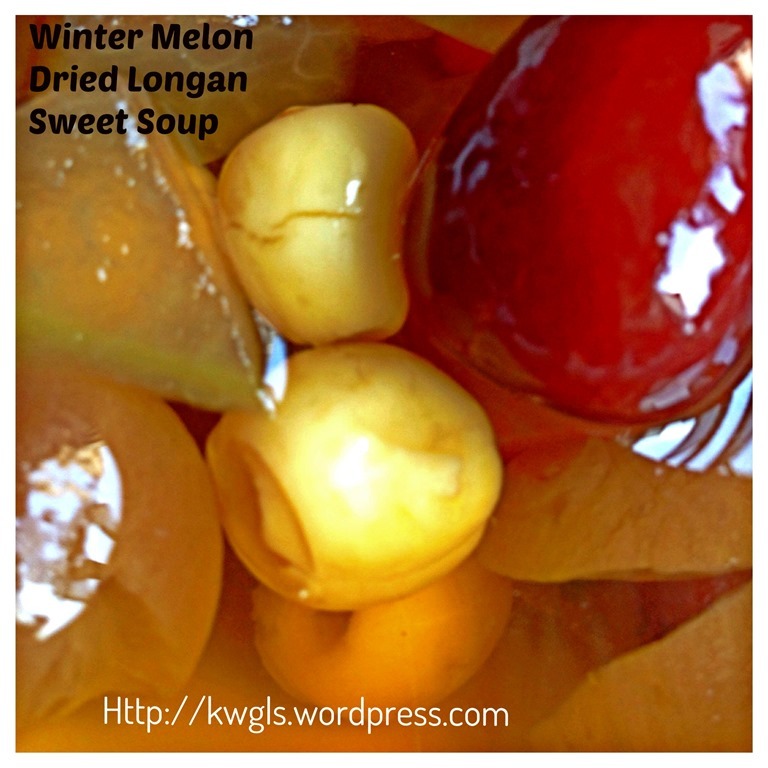 Once it boiled, turn to medium to small heat until winter melon cubes are soft and transparent. It should take about 25-30 minutes. If you have time, you can let it simmer longer and the longer the time you simmer, the more flavourful your soup will be. Before you off the heat, add the rock sugar (if you haven’t add earlier). You may want to take this opportunity to taste the sweet soup and assess whether it is sweet enough or if there is a need to dilute or additional rock sugar. Once the rock sugar dissolves, off the heat and depending on your liking, it can be served hot or cold. 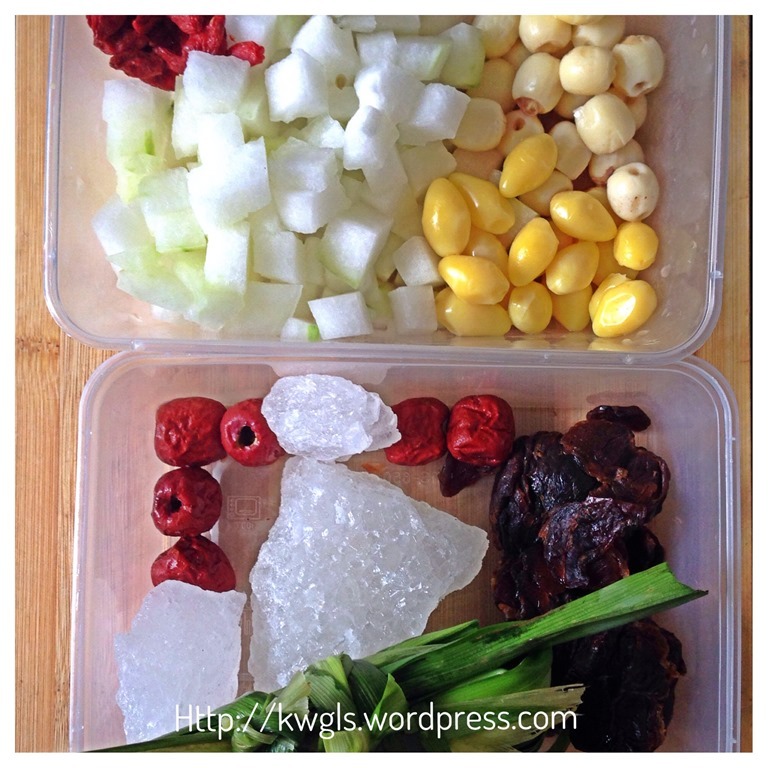 The recipe is so simple that it had only one image for illustration. Nothing to shout about but this is a rather nice combo. Since my family liked the flavoured watery soup (instead of the side ingredients), so my version is without much ingredients. However, you can easily adjust the quantity to suit your taste buds. 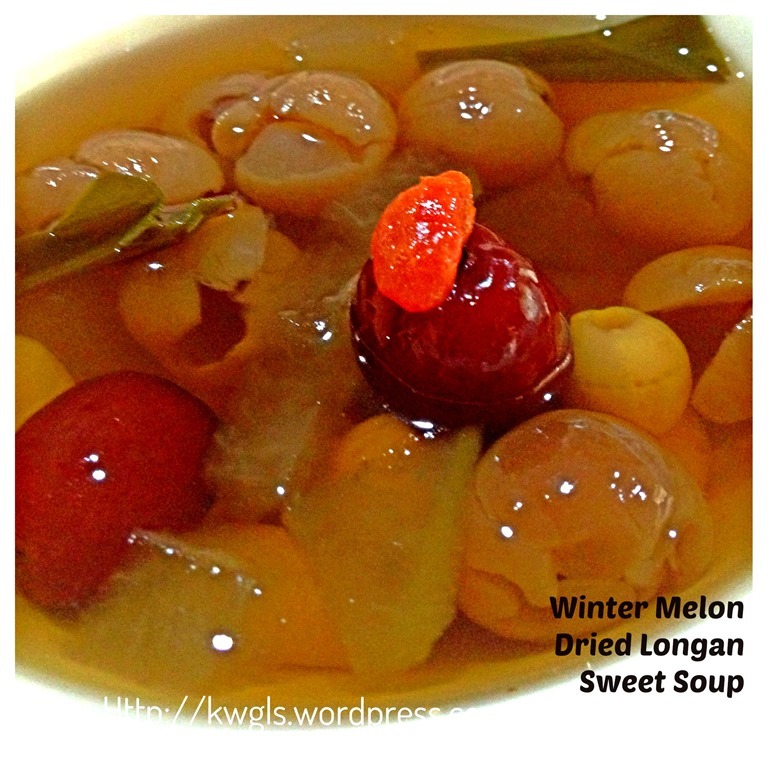 In this hot weather, I would believed this a healthier, cooling dessert after the heavy Chinese New Year Feast. 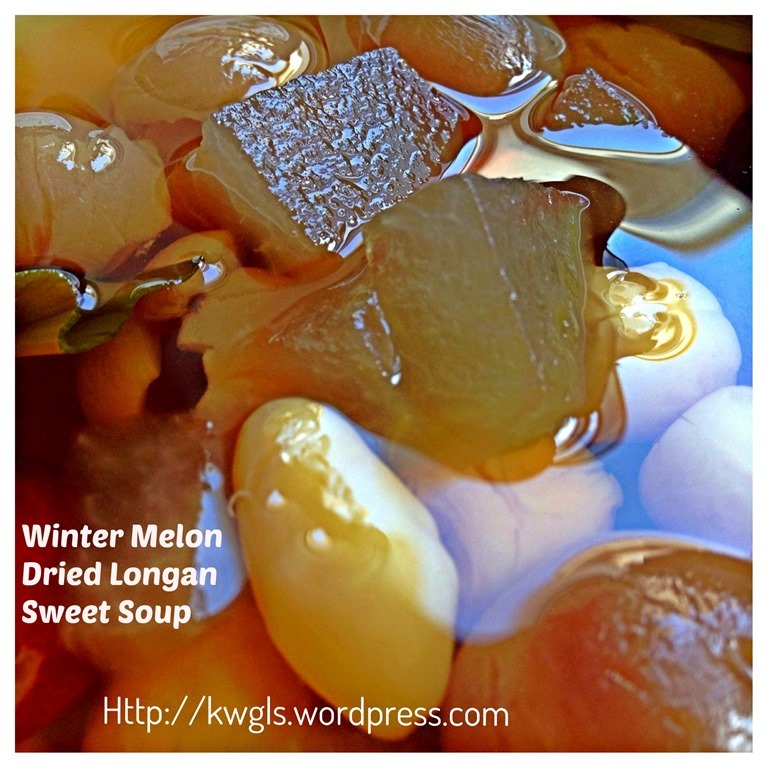 This entry was posted in Desserts, Food Preparation Series and tagged 8, dry longan, GUAI SHU SHU, Guaishushu, kenneth goh, postaday, winter melon longan soup, 冬瓜桂圆甜汤，， Winter melon. Bookmark the permalink. 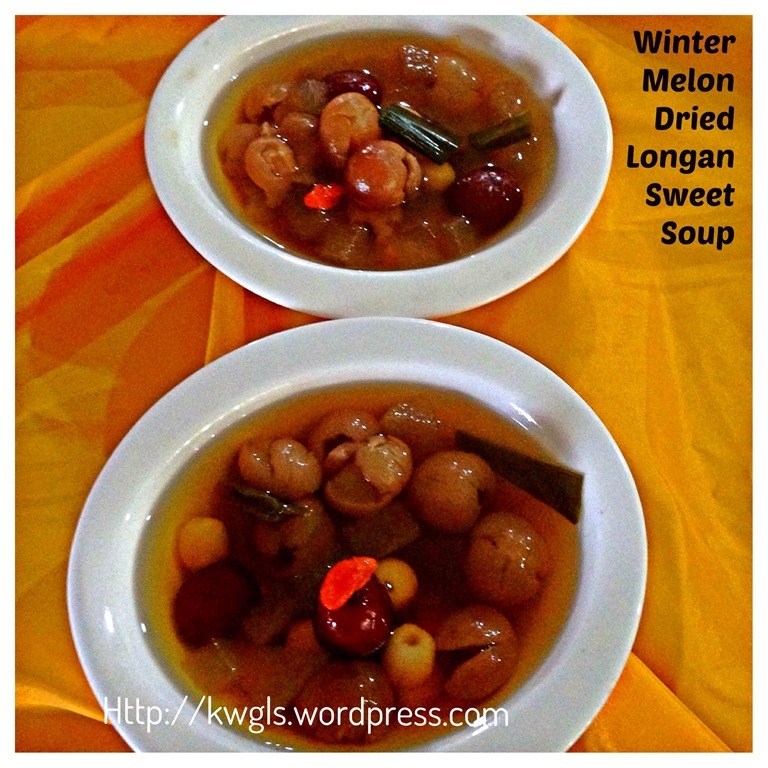 Melon and pork sounds like a wonderful combination that I have not considered before. Thanks so much for sharing. G’day and interesting combination Kenneth!